This may seem like a counter-intuitive thing to say, but it’s good for Mary Gauthier’s audience that she has real limitations as a singer. Her awareness that her vocal instrument isn’t the most supple one in the world has compelled her to cultivate a rich palette of unconventional vocal shadings, textures and tones, which is part of what makes her such a gripping storyteller. 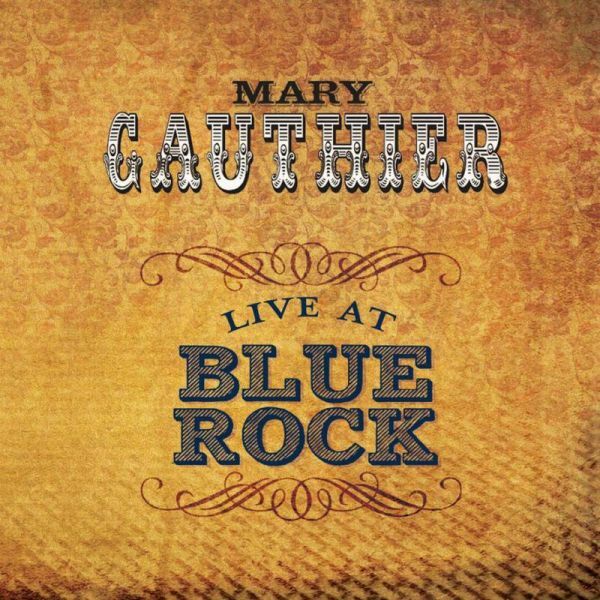 Despite the fact that Live At Blue Rock contains songs that have already appeared on five of Gauthier’s six studio albums, these renditions feel very different than those she laid down in the studio. 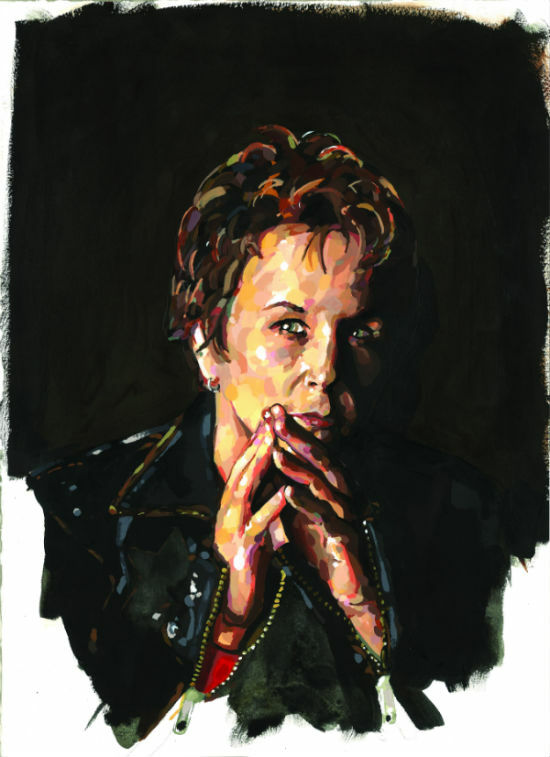 This time around, the Louisiana-born, Nashville-based singer-songwriter had people right there in the room with her – the venue is an artists’ ranch in Wimberley, Texas – and their presence makes a palpable difference. You can tell they were on the receiving end of a fiercely focused performance. Gauthier rejects mainstream entertainment values, the showy mastery, perkiness and polish that aim at providing musical diversion and courting mass popularity. Hers is a confrontational art, especially in a live setting. She directs attention to the unsettling side of contemporary American society, not only by making executed murderers, unrepentant alcoholics and troubled teenage adoptees her lead characters, but by telling their stories in such strenuous, committed fashion. There’s a penetrating potency to Gauthier’s delivery of these songs, as though she’s daring somebody to challenge her on whether or not the people she chooses to sing about are worthy of attention, and whether she’s really telling the truth about the desperation of their outsider existences. Such a visceral style of performance isn’t typically thought of in terms of virtuosity, but that’s a quality her storytelling often possesses all the same. Gauthier seems the least invested in introspection about romantic relationships – which is many a modern songwriters’ bread and butter – and when she does go there in her writing, it doesn’t tend to pack quite the punch of her other narrative-unfurling and scene-setting. There are also three Fred Eaglesmith covers in this set, but none of those performances top what she does with her own songs. Gauthier speaks her lyrics just as often as she sings them, and she uses the contrast between those vocalizations to convey a lot. As she picks up steam during the surging, impressionistic number “Blood Is Blood,” she eventually reaches a point where she intones the song’s title – underscoring how taken-for-granted that three-word statement is – before moaning “Blood don’t wash away” with a high, held-out note, a leap that captures the peculiar pain of being cut off from any and all blood relations. She’s marked off where cozy normalcy ends and isolating idiosyncrasy begins, and the latter standpoint is amplified by Tania Elizabeth’s searingly surreal contributions on fiddle. Gauthier’s wry sense of humor is most clearly displayed during “Drag Queens In Limousines” a woozy, explicitly autobiographical waltz that pokes fun at her utter inability to fit in growing up. Musically, she gets the most playful during the album’s funky-folkie final track, “Wheel Inside The Wheel.” She spends the verses colorfully cataloging characters in an otherworldly Mardi Gras scene, but at the chorus she turns into a knowing, nimble blueswoman, moaning here, syncopating there and sounding intensely cool throughout. Gauthier puts on a show, all right, but it’s not the sort of entertainment that casts the audience in a passive role. Of those who show up – and a devoted bunch they are – she demands engagement, and rewards it.